These beautiful felines have not been seen in the wild for 25 years. They are known to be 'functionally extinct'. The South China Tiger, also known as the Chinese, Amoy or Xiamen Tiger, used to roam the temperate forests of southeast China. Some believe that this tiger is the original tiger from which all other tiger subspecies evolved. It is the second smallest of all tiger subspecies weighing between the 100kg – 195kg (221lb- 430lbs). This small stature allows the tigers to swiftly move through dense forests with greater ease than their larger cousins. Like other tigers the South China Tiger is strong, fast and a keen hunter of other large mammals like deer, wild boar and cattle. The tiger hunting style combines patience, timing and speed. They usually stalk their prey, hiding in vegetation until an opportunity to attack. When they do attack, they try to bite through the neck of the victim. They hunt alone and are even able to hunt in water as well as on land. Female South China Tigers will be pregnant for 3 to 4 months before giving birth to a litter of up to 5 cubs. When born, tiger cubs are blind and weigh a tiny 1kg (2lb), which is about a third of the size of an average human baby. Cubs stay with their mother for around 18 months, gaining strength and learning the skill of hunting before they can prowl the forests alone and assume the solitary life of a tiger. As with all other tigers, their fur has distinctive black stripes over the burnt orange coat. However, the stripes of the South China Tiger are noticeably thicker and spaced further apart, giving them the look of an iconic tiger. Like the human fingerprint, tiger’s stripes are unique to each individual and can be used to identify one tiger from the next. 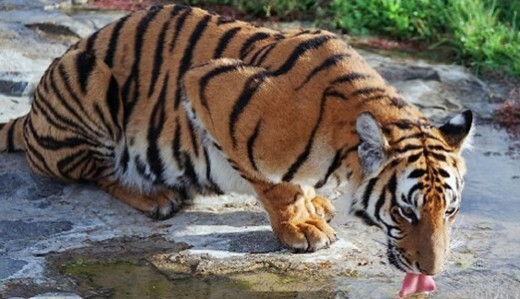 Tragically, the South China Tiger has not been in the wild for 25 years. They are only now found in captivity in China and in South Africa, making them what is called ‘functionally extinct’. Even in captivity, only 100 of these intelligent and extraordinary beings are left. This makes extinction a real probability. In the 1950’s the South China Tiger population was estimated to be around 4000. As a result of these animals inhabiting an area that coincides with land used by humans, the South China Tiger became seen as more of a pest and a danger to people than one of nature’s beautiful creatures that needed protection. In 1979, the Chinese Government banned the hunting of tigers but by that time thousands of tigers had been killed and it made little difference to their survival. By 1996, it was estimated that the wild population had been hunted down to 30-80 tigers. The future of this sub-species will be determined by the success of visionary conservationists who hope to reintroduce these beautiful creatures back into the wild once they have successfully learned how to hunt in the wild. This technique is called ‘rewilding’ and it is hoped it will allow the South China Tiger to thrive once again.